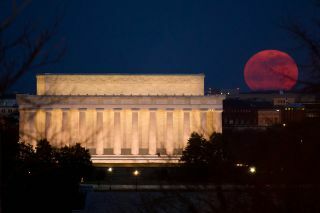 A so-called supermoon full moon rises over the Lincoln Memorial in Washington D.C. in this NASA photograph by veteran space photographer Bill Ingalls in 2011. Ingalls has shared tips to photograph the Nov. 14 supermoon, which will be the closest full moon in nearly 69 years. The biggest, brightest full moon of 2016 is just around the corner. If you'd like to capture the memory of Monday's supermoon on camera, a pro photographer at NASA has some tips for you. A so-called supermoon takes place when the moon, in its full phase, is at the closest point to Earth in the 27-day lunar orbit. The Nov. 14 supermoon will appear about 15 percent larger than average and is the closest full moon in 68 years. Make sure you put something in the same frame as the moon, perhaps a building or some other land-based object. Without any other object for reference, Ingalls said, the shot won't stand out among the pack. "It can be a local landmark, or anything to give your photo a sense of place," he said. This will likely mean you'll be shooting the moon while it's closer to the horizon. This also works in your favor because the moon appears larger at the horizon; the reason for that phenomenon is a matter of debate. Even if you don't live near a huge monument or have access to some of the special rooftops Ingalls gets to visit for his job, you can still make your shot memorable. Ingalls said he went to Shenandoah National Park in 2009 to photograph Comet Lulin and was initially worried about his shot because he didn't have a telescope with him, unlike other photographers. So instead, Ingalls chose to use the red light of his headlamp to illuminate the forest while shooting the moon with a long lens between the trees. National Geographic called that photo one of the top 10 space photos of the year. The Nov. 14 supermoon is a perfect opportunity to introduce kids to astronomy. In the U.S., the moon will rise at around 4:30 p.m. local time Sunday afternoon (Nov. 13). The moon will reach its closest point to Earth and its peak fullness in the morning hours of Nov. 14, and it will set out of view at around 7:30 a.m. local time. If the skies aren't clear in your area during that time, you can still try Monday night, when viewing opportunities will also be good. If you can get your kids to stand still for a few minutes, you can even include them in the shot with the moon, Ingalls said. "There are lots of great photos of people appearing to be holding the moon in their hand and that kind of thing," he said. "You can get really creative with it." Another thing to remember is that daylight white balance is the best setting to capture the moonlight, according to Ingalls. After all, the moon is reflecting the sun's light. If you're planning to use a longer lens, "Keep in mind that the moon is a moving object. It's a balancing act between trying to get the right exposure and realizing that the shutter speed typically needs to be a lot faster," Ingalls said. If you don't have an SLR camera on hand, Ingalls said you can still get some fun panoramic shots on a smartphone. (He joked that as a professional photographer, he would personally find the experience "maddening and frustrating," though.) He suggested going to an urban area with a lighted foreground. Once you're there, "Tap the screen, and hold your finger on the object (in this case, the moon) to lock the focus," he said. "Then, slide your finger up or down to darken or lighten the exposure." The Slooh Community Observatory will offer a live broadcast for November's full moon on Nov. 13 at 8 p.m. EST (0100 GMT on Nov. 14). You can also watch the supermoon live on Space.com, courtesy of Slooh. Editor's note: If you snap an amazing photo of Mars at opposition and would like to share it with Space.com and our news partners for a possible story or image gallery, send images and comments to managing editor Tariq Malik at spacephotos@space.com. Follow Elizabeth Howell @howellspace, or Space.com @Spacedotcom. We're also on Facebook and Google+.Original article on Space.com.